The former Beatle's 2009 concert will debut on Blu-ray next month. In an early announcement to retailers, Image Entertainment is preparing 'Ringo Starr and the Roundheads: Live' for Blu-ray on January 3. 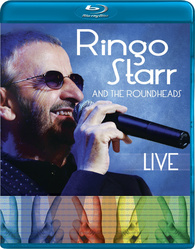 Filmed at this historic Genesee Theatre in Waukegan, Illinois, this amazing, one-night-only event presents Ringo Starr performing five Beatles classics along with his greatest solo hits in a career-spanning set with The Roundheads. You can find the latest specs for 'Ringo Starr and the Roundheads: Live' linked from our Blu-ray Release Schedule, where it's now indexed under January 3.